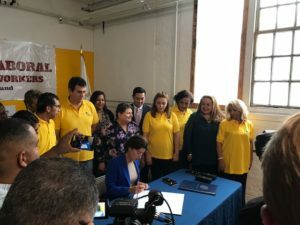 Last Wednesday, October 25, 2017, Governor Gina Raimondo travelled to Fuerza Laboral headquarters to sign new legislation on Workers’ Cooperatives into law. 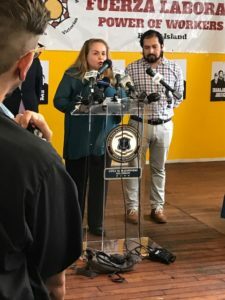 This bill, which the Center for Justice supported and clarified and standardized the means for workers to own the businesses they work at, is a tremendous boon to the working people of Rhode Island. 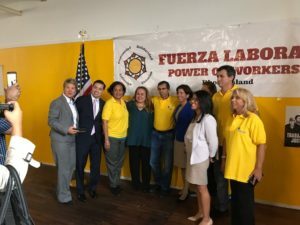 We commend Fuerza Laboral and all of our coalition partners building the groundwork for a fairer economy for Rhode Island. We intend to have more information about the operation of this piece of law available for people on this site and on social media as it is implemented. Governor Raimondo signing the Worker Co-Op bill into law.